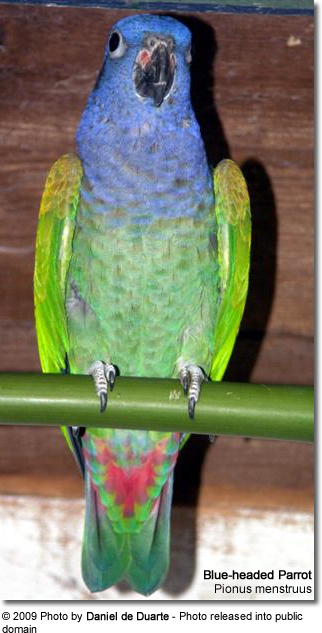 Pionus parrots are regarded as excellent pets, although some species are very rare in captivity. Most commonly kept species are the Blue-headed, Maximillian (Scaly-headed) and White-Capped. Others, such as the Dusky and the Bronze-winged have become more common due to captive breeding. 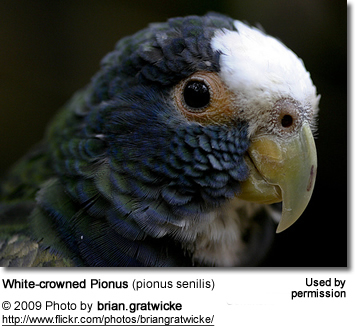 Pionus parrots are not known to be cuddly birds and can be described as reserved. Once they are bonded, however, they like to be preened (their heads and necks scratched). They are not particularly playful, and do not enjoy being wrestled with or flipped on their backs, but they do provide noninvasive companionship and are fascinating companion animals. When excited or frightened, birds of this genus may make a characteristic wheezing or snorting sound that is sometimes mistaken for a sign of distress. Others freeze when scared. They also have a musky or sweet odor that some people find unpleasant, but others enjoy. They are not the best talkers -- in fact some pionuses may never learn to talk. The clarity of Pionus "speech" ranges from rather clear to words only a mother could understand. This varies greatly with individuals. Most Pionus do love to learn new and interesting sounds. Pionus parrots are known for their quiet (compared to many other parrots) and reserved natures. Unlike some other companion parrots, aviculturists have noted that they are not particularly energetic, and do not generally enjoy hands-on play (for example, being flipped on their backs), but they do provide companionship and are described as gentle and charming pets. The Pionus parrots are devoted to their owners and thrive on attention - however, some of them, particularly males, may bond with one person and aggressively protect that person from perceived dangers, including other family members. They are active by nature and may become overweight if closely confined. Even though these parrots are less noisy birds than other parrots, they do make light, high-pitched squeaking calls that might annoy those who are sensitive to noise. 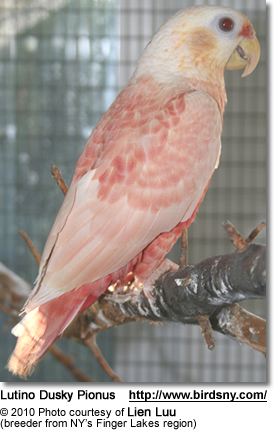 Pionus parrots are susceptible to obesity, vitamin A deficiency, and aspergillosis in captivity. Biting: The pionus parrots are not known to be biters, but they can break your skin if they are scared or startled; or simply don't want to be handled for some reason (maybe not bonded). The experienced parrot owner will be able to read their parrot's body language to know when he or she does not want to be handled. This all being said, their bites are generally not nearly as fierce as the bites of other birds and, therefore, they do make a good choice for anyone who is intiimidated by parrot beaks. Attention: The Pionus parrots demand less time than their larger cousins. As long as they are given sufficient attention by their owner in the morning and/or evening (AT LEAST a couple of hours), they generally can be left alone during the day. They should be given the opportunity to exercise outside the cage and enjoy activities with their owner. Birds that spend most of the day in the cage also should be given a large cage that will accommodate toys and room for exercise. Environmental enhancements, such as leaving the TV or radio on for entertainment, are also recommended..
Pionus parrots are generally gentle and loving in nature and make devoted family pets. They share the sweet and fun disposition of their related cousins. They are generally easy-going and intelligent. These personal qualities make them suitable candidates for first-time bird owners. These birds are also excellent choices for apartment dwellers, due to their easy mainteannce and calm personality. Pet owners generally describe them as inquisitive and sociable parrots that can easily be tamed. They are less apt to bite than other parrots. Even though they are not known for their talking abilities, with a little bit of training, some may learn to mimic (although not all learn to talk!). They enjoy frequent baths as this helps to keep their plumage in good condition. Even though a medium-sized parrot cage is acceptable for a pionus, larger size cages will allow them to move about more freely and provide more space for toys. These playful birds do need toys to keep them entertained. They seem to be particularly fond of swings. The Pionus parrots thrive on attention - however, some of them, particularly males, may bond with one person and aggressively defend that person from perceived dangers, including other family members. These birds are active by nature and may become overweight if closely confined. Even though these parrots are less noisy birds than other parrots, they do make light, high-pitched squeaking calls that might irritate those who are sensitive to noise. The Pionus is a very active parrot and needs the largest space that your home can accommodate -- ideally, this parrot should be able to fly from perch to perch, especially so if the pionus is kept in the cage most of the day. This being said, however roomy the cage, every bird should be allowed to be out of the cage for a minimum of three hours each day. Many birds can spend a good deal of their time on a play pen or parrot perch. As they are not strong chewers, durable cage construction is not as critical as it would be for the largest species of parrots. They are technically inclined and learn to open locks pretty quickly and locks or escape-proof latches may be recommended. Once they have learned a behavior such as stepping up they are very obedient and will remain steady in their training.